(From Sigma lens literature) The addition of the 18-250mm F3.5-6.3 DC Macro OS HSM speaks to Sigma’s versatile product lineup with this multipurpose zoom lens that offers Optical Stabilization (OS) and covers wide angle to telephoto to macro photography. 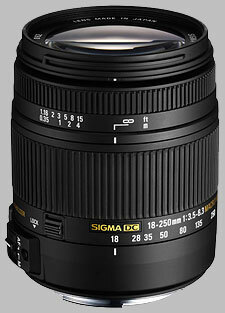 It differs from Sigma’s current 18-250mm F3.5-6.3 DC OS HSM lens with its even more compact size, its macro capability with a maximum magnification ratio of 1:2.9 and the use of Thermally Stable Composite (TSC) material currently used only by Sigma. Very quality lens, half the price of the similar nikon model. Very good sharpness at F8-F11, at almost all focal lengths. Small and light, OS is working well. Compatibility problems with the new nikon bodies. I had to turn the lens in the dealer, in order to update the firmware of the lens, because OS and auto focus were not working, the second on live view only. That, in my opinion is a little inconvenient for the customer, who also as i understood must update all of his sigma lenses in order to work properly with new nikon bodies. How sad is that. Go buy it without a second thought, this lens is amazing, the best travel lens out there at this time. Just check if it has the new firmware from box. Sigma announced that new deliveries will have it with a specific sticker on box. Lens creep without the lock. Got a lot for what I paid, relatively sharp throughout the range.Excellent walk around lens. Can handhold at around 1/40th to 1/50th at 250mm, in spite of my 70 year old hands.The lock is needed as some lens creep is apparent. Nice metal mount, this lens performs better than the early Nikon 18-200mm VR I I used to own. I owned a previous version of this lens for Canon and this is a new edition. I have owned many lenses and a number of cameras and presently this is being used on a Sony A57. The results have been absolutely stellar. For my money this is the best all round lens and I found that the shots were superior in every way to the Tamron 18-275mm which I sold a few months ago.